It has been a while since my last post. If you ask what I've been up to, basically, the title sums it up. With two younger boys in baseball, finishing up school recently, and now all the summer activities, it has been about a full time job being a scheduler, chauffeur, and athletic supporter (ha!). I have had a few longer runs built into my training plan for 50k Afton Trail run on July 3rd and have actually managed to get them in. One run recently involved me getting up at 3:30 am to be running by 4 am. With a 4 hour run, and some stops, the total run finished up around 8:30 am. Then off to work - but I did get the run in!! With all the training, I feel pretty good moving toward the 50k. I have a couple more hard workouts left, including a 4.5 hour easy run and a 60 minute tempo run, then begin to taper around 10 days out from the race. 1- Proper fueling does help!! At Ice Age, I ran out of gas and I decided that I would focus on proper fueling for Afton. So, I found that I really like GU. Seriously, I have started to use these and I can really tell they help. 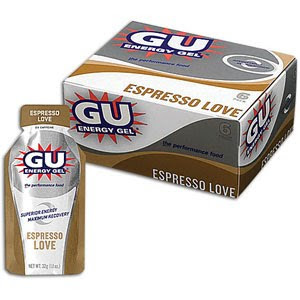 I rarely feel like I'm running out of gas during my runs by using the GUs to help provide the proper nutrition. I have two flavors that seem to work for me: vanilla bean and Espresso love. On longer runs, I try and space these out about 45 minutes each. On a three hour run, that means about 4 of them. With a 4 or 4.5 hr run, this means 5 or 6. I try and use the vanilla bean for most of the run, and when things start to get tough or I feel like I'm going to hit the wall, I'll use the espresso love with 2x the caffeine to help get me through it. Along with using HEED, there really is no excuse to run out of gas like I did at Ice Age. 2- I recently upgraded my phone to a myTouch android phone. I'm not that different than others in this category, moving to a smart phone, but I did find out about the versatility of the phone and apps that I can use. For my runs less than 2 hrs, I feel comfortable using my phone for both music (through Pandora app) and GPS distance and time (through Cardio Trainer). 3 - I've recently started to follow more blogs regarding "elite" ultra trail runners. Geoff Roes, Karl Meltzer, Hal Koerner and the likes. My biggest takeaway is the difference in training each one of these elites do. Some do just over a hundred miles a week, others do 200. It amazes me that there is this much difference in training for these elites. I have always thought the more mileage the better, but after reading blogs, it really does come down to 2-3 long runs a week, mixed in with some solid tempo running, and some hard hills. Each one also stresses the importance of recovery and feeling strong. It will be interesting to see how Western States pans out this year - my two picks are Geoff and Hal in that order.